The Liberian Connection | "Northern Crossings"
Congratulations to Gifty Kollie. This is a picture from her Graduation from Mayer Lutheran High School last wee. She stayed with Pastor Dennis and Mary McManus the past 3 years. They are on the left. 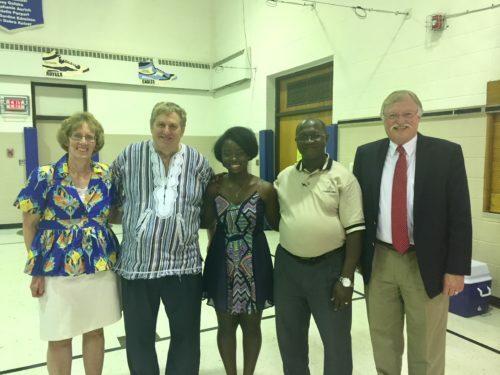 Pastor McManus is a strong supporter of Porject 24 and his daughter Julie was one of our Mary Okeyo Scholarship travelers who became a Missouri Synod GEO missionary. Gifty is hoping to continue her studies and become a Deaconess. There were a number of Liberians present including her father, Rev. James Kollie, to her right and rounding out the picture is President Fondow from the Minnesota North District. Aunt Vivian RIP. Another Christmas Passing. Smircks and Sneers, Sticks and Stones, Word and Deeds.